When travelling to the mountains the human body needs to adapt, i.e. acclimatize, to the lower air pressure and lower oxygen pressure. If the acclimatization fails due to the too fast ascent or the anomalous characteristics of the climber the result is a state called acute mountain sickness (AMS). This, in the wors case, may lead to death. Approximately 40% of the persons ascending to the altitude of 4200m will get symptoms of AMS. Since the rate of the ascent affects the development of the AMS, the recognition and anticipation of the first symptoms has got a lot of attention. Studies have been published about how following the sensitivity of swallow (gag) reflex, the ability to hold breath, hyperventilatory response, kemosensitivity of breath and oxygen saturation in rest (SaO2r) have provided aid on estimating acclimatization and anticipate getting AMS. Based on some earlier studies (abstract XIII Physical medicine symposium, Helsinki) we feel that the decline of the oxygen saturation (SaO2ex) in the end of excercise anticipates problems in acclimatization better than only monitoring the SaO2r or changes in the resting heart rate. In this study we try to find tools to recognize vulnerability to AMS already before starting the climbing. The target is to develop usable and field proven methods to anticipate AMS for a normal climbers. A group of top level climbers (n=10) will undertake exertion breath analysis in sea level and simulated heights (3000 m, 4000 m ja 5000 m). 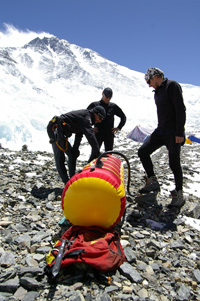 Those parameters and oxygen saturation, heart rate and the pulse interval changes are evaluated based on their acclimatization and performance while climbing on Mount Everest in spring 2009. From the study we will gain new information of the first symptomps of AMS and usability of the methods to anticipate AMS and controlling the rate of ascent in field conditions. This study is a continuation to a study of acclimatization and anticipation of AMS started in 2001.